This week I have decided to be brave and enter the Global Design Project #GDP076 challenge! 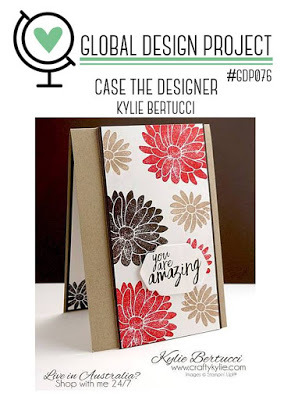 This great challenge is set by a fabulous group of Stampin'Up! demonstrators from far and wide. This weeks challenge has been set by the lovely Kylie Bertucci. She has given us a card to CASE and here is my entry. For my card I have used the Just Keep Swimming stamp set from the S/S catalogue. This is a great stamp set as it contains lots of different images for many different occasions, In fact there are 22 photopolymer stamps in this set for just £14! I chose to use the 2 step diamond on my card and the sentiment You're a Gem. My cardbase is Crumbcake and then I used Calypso Coral and Very Vanilla with a hint of copper for the panels on the card. I also used some of the ombre calypso coral ribbon from the cupcakes and carousels embellishment kit. I used the banners punch to cut out my sentiment and used some dimensionals to make it stand out a little. 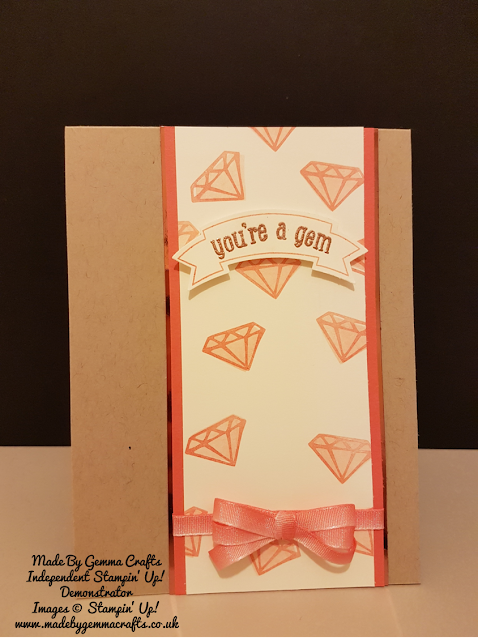 What a lovely way to use this stamp set Gemma! I'm thrilled you took part in CASEing me this week and I love what you have come up with. Thank you!